Pacific Office Automation is aware of the many different values having a company that is energy efficient and environmentally conscious. As a Sharp dealer, Pacific Office Automation provides you with office technology to fit these needs. 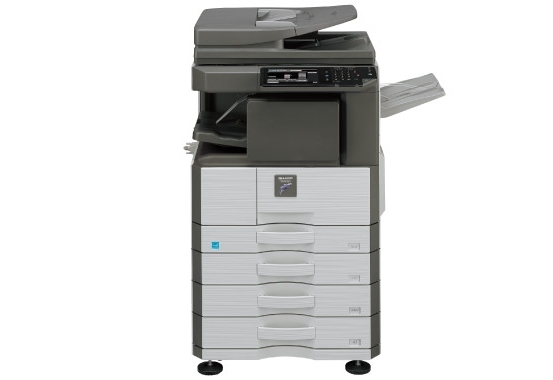 The MX-B402 will streamline and optimize your office space with all of the standard features of a MFP with the added benefit of being an Energy Star product and a refillable developer system. This system will provide you with less waste and increased toner lifespan, doubling the standard lifespan to 20,000 pages. This increased lifespan of toner does not affect the professional quality of the color and black and white images produced. The MX-B402 provides you with the option of printing your documents using either 1,200 dpi (dots per inch) or 600 dpi, giving you control over how much ink is used on each document. With an increased lifespan, the amount of downtime spent with printer repair and upkeep will be considerably decreased, allowing the flow of your office to remain as constant as possible. The MX-B402 also has a powerful 800 MHz multi-tasking color document system that allows you to input a new job with the 7” color touch-screen interface, while your coworkers continue to complete their printing, scanning, and faxing jobs from their personal workstations. To cut down on your day-to-day expenses, the MX-B402 allows you the option to receive incoming faxes through your e-mail as well as send faxes from your desktop computer, cutting down on your over all paper consumption. With the slick and economical Send-to-Group office technology you and your coworkers will be able to broadcast an important document in multiple forms by only performing a single command. With ImageSCAN, your office organization will be a breeze. By using ImageSCAN you can scan and send your document to up to 7 destinations at once including any networked folder. To keep up with your quick and growing office space and keep your work safe, Sharp provides their multi-layered security suite.